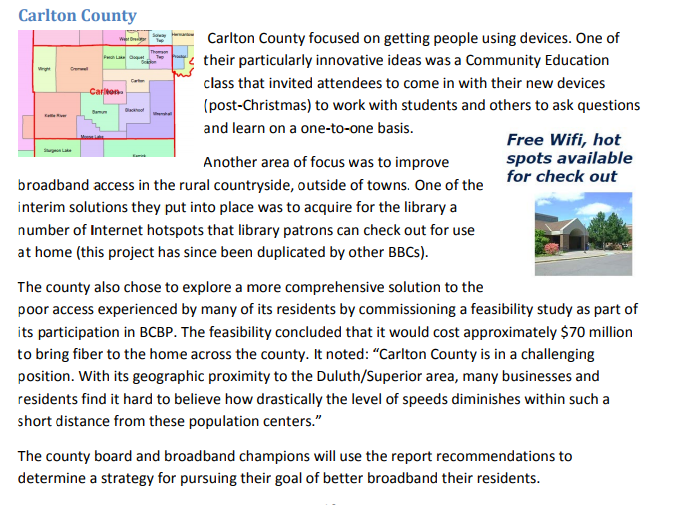 Carlton County focused on getting people using devices. One of their particularly innovative ideas was a Community Education class that invited attendees to come in with their new devices (post-Christmas) to work with students and others to ask questions and learn on a one-to-one basis. Another area of focus was to improve broadband access in the rural countryside, outside of towns. One of the interim solutions they put into place was to acquire for the library a number of Internet hotspots that library patrons can check out for use at home (this project has since been duplicated by other BBCs). The county board and broadband champions will use the report recommendations to determine a strategy for pursuing their goal of better broadband their residents. For a more recent look at Carlton County – check out the county profile I did earlier this year.